Matthew Apgar - mapgar@shawmedia.com Northwood Middle School students (from left) Clay Truman, Jacob Brucker, and Luke Duenas discuss a science question during the 28th annual Scholastic Bowl on Thursday, April 23, 2015 at Marengo Community Middle School in Marengo. Teams from 17 different schools compete against each other in a variety of school subjects. Matthew Apgar - mapgar@shawmedia.com Richard Bernotas Middle School students Travis Huberty, left, and Ian Shuman ponder a science question during the 28th annual Scholastic Bowl on Thursday, April 23, 2015 at Marengo Community Middle School in Marengo. Teams from 17 different schools compete against each other in a variety of school subjects. Matthew Apgar - mapgar@shawmedia.com Steve Sturm of Immanuel Lutheran School laughs with teammates after correctly answering a science question in the 28th annual Scholastic Bowl on Thursday, April 23, 2015 at Marengo Community Middle School in Marengo. Their question, to name the shortest day of the year, was first answered as "winter solstice" but then requested to be specified to the exact month and day. Sturm correctly replied with December 21. Matthew Apgar - mapgar@shawmedia.com Northwood Middle School student Ellie Thurow, center, looks up at her teammates across the table as they work on a science question during in the 28th annual Scholastic Bowl on Thursday, April 23, 2015 at Marengo Community Middle School in Marengo. Teams from 17 different schools compete against each other in a variety of school subjects. Matthew Apgar - mapgar@shawmedia.com Northwood Middle School student Clay Truman answers a science question during in the 28th annual Scholastic Bowl on Thursday, April 23, 2015 at Marengo Community Middle School in Marengo. Teams from 17 different schools compete against each other in a variety of school subjects. 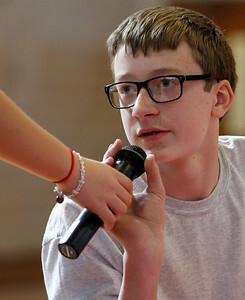 Matthew Apgar - mapgar@shawmedia.com Montini Middle School student Alex Eschenbacher answers a science question during in the 28th annual Scholastic Bowl on Thursday, April 23, 2015 at Marengo Community Middle School in Marengo. Teams from 17 different schools compete against each other in a variety of school subjects. 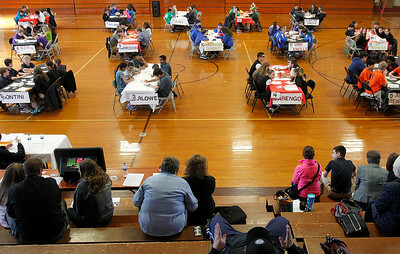 Matthew Apgar - mapgar@shawmedia.com Timmy Leahy of Immanuel Lutheran School watches as students from Marlowe Middle School work through a science question in the 28th annual Scholastic Bowl on Thursday, April 23, 2015 at Marengo Community Middle School in Marengo. Teams from 17 different schools compete against each other in a variety of school subjects. Matthew Apgar - mapgar@shawmedia.com Students pack the Marengo Community Middle School gymnasium as they compete in the 28th annual Scholastic Bowl on Thursday, April 23, 2015 in Marengo. Teams from 17 different schools compete against each other in a variety of school subjects. Montini Middle School student Alex Eschenbacher answers a science question during in the 28th annual Scholastic Bowl on Thursday, April 23, 2015 at Marengo Community Middle School in Marengo. Teams from 17 different schools compete against each other in a variety of school subjects.